One day a recipe caught my eye. When I looked at the blog it was posted on, they credited Cathy at The Noble Pig with the original. Okay, time to go to the source. 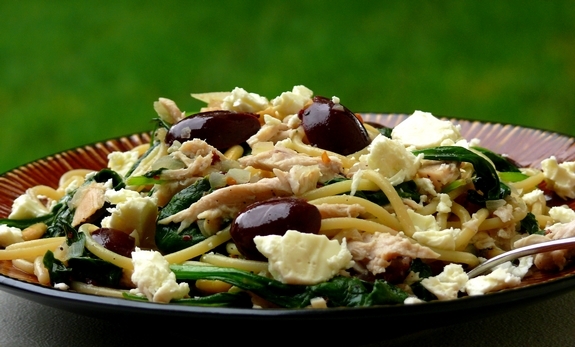 After perusing for a bit, I decided I wanted to try this recipe for Greek Chicken Pasta. Let's face it, on a busy day who doesn't love a great quick and easy pasta dish. I am out for most of the day today, so giving this a go tonight for supper along with a leafy salad. Pasta dishes can be bland if you're not careful as pasta has a tendency to really soak up the flavours. The strong salty notes in this one provided by the Kalamata Olives and the Feta cheese give this pop. The fresh spinach adds colour and the shredded rotisserie chicken help make this a quick to prepare dish. To anyone who tries to shortcut with dried onion and garlic powder, I can only say make time for the fresh product. It makes a huge flavour difference. I made one change - the nuts. For whatever reason, pine nuts are okay - but just not my favourite in terms of taste and texture. I am using roasted pistachio seeds when I make it tonight, but also love pumpkin seeds, cashews or almond slivers. That's the great part about recipes - you can make small adjustments to accommodate your preferences. Be careful if you want to change any of the bolder taste elements as the recipe is built around those. Better to start from scratch. The funny note here is when I copied and pasted this onto my site, I noticed that Cathy credits Sunset. I assume she means Sunset Magazine. So the recipe is not hers originally and no notes are there to indicate if she changed it in any way. Then I discovered this isn't a food blog per se - it is a blog for a winery called The Noble Pig in Carlton, Oregon. Their recommendation to pair with this dish? Noble Pig Pinot Blanc! Note - made this last night and impressed. Easy and tasty. It's the salty Kalamata olives and feta that make it pop, so if you don't like these salty olives, it will be a very mild dish. Enjoy! Cook spaghetti as package directs or to taste. Heat oil in a large frying pan over medium heat. Add onion and garlic and cook until softened, about 5 minutes. Stir in spinach, wine, chile flakes, olives, pine nuts, salt and pepper. Drain pasta, return to pot, and add onion mixture and chicken. Stir to coat and cook over medium heat until warmed, about 4 minutes. Transfer to plates and top with feta cheese.